Jamie is my middle son, he was born on March 6,1984, he died on October 20,2011 at Vanderbilt Hospital. This blog and forthcoming book is about my journey learning about “brain death”. None of us go through our time on earth without experiencing a few life altering events. Some occur when you get married, some when you achieve the pentacle of your career, some are good, some are bad…and some become your destiny or calling. The journey I am on now is not one of my own choosing but it is one I have embraced and am passionate about. It concerns brain death. Brain death is a legal term that has gained world wide acceptance in the medical community and throughout hospitals across the nation. 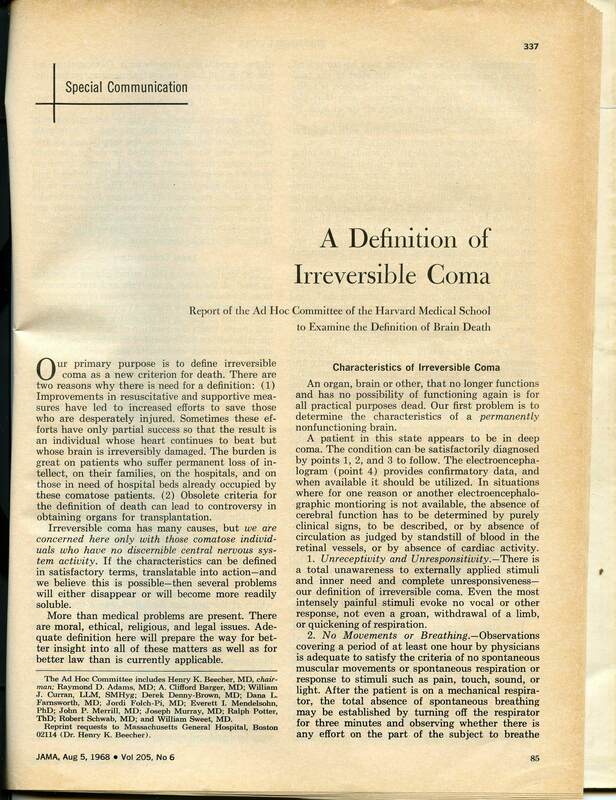 The theory of brain death came about via an Ad Hoc Committee at Harvard University in 1968. Thirteen men met to formulate a new legal definition of death. Up until the Harvard Committee published their paper, death in the United States and most countries meant the cessation of the respiratory and circulatory systems. In essence you were dead when your heart stopped beating and your lungs stopped functioning. After the Harvard Criteria, a new legal definition of death was added to the long held definition of death. The new definition added the “irreversible cessation of all functions of the entire brain, including the brain stem. The Harvard Committee’s new definition of death was NOT based on any clinical or scientific studies, performed on either humans or animals. No scientific evidence or clinical trials were presented at all ! By 1978 in the U.S. over 30 different sets of criteria had been published,each new set less strict than its predecessor. No single organ, including the brain,controls all the other vital organs. As Shewmon notes, hearts can beat independently without brain function and many other systems in our bodies continue on their own. Dr Shewmon, the noted neurologist argues that a diagnosis of death by neurological criteria is based on an erroneous theory, not on scientific fact. Also,complete irreversibility of neurological function is an arbitrary prognosis, not a medically observable fact. Dr. Shewmon,at one point in time believed in the “theory of brain death” until the facts changed his opinion. I had not considered or thought about the concept of “brain death”. Like most people we only came face to face with it when a decision had to be made. Now I know and this is the purpose of this blog and future book. To help other families going through a traumatic situation and to tell the truth to families about brain death and transplantation. Here is a paper written by Dr. Shewmon “You Only Die Once:Why Brain Death Is Not The Death of a Human Being.